PNG gave PNG LNG a tax subsidy of at least K504.3 million in 2017. I nearly choked on my breakfast when I came across that number on page 126 of the 2019 Budget Volume 1 produced by the PNG Treasury. It is the conclusion of a section described as “briefly summarizes the tax expenditures provided to the PNG LNG project and the estimated revenue foregone” – see here with the budget paper available here. 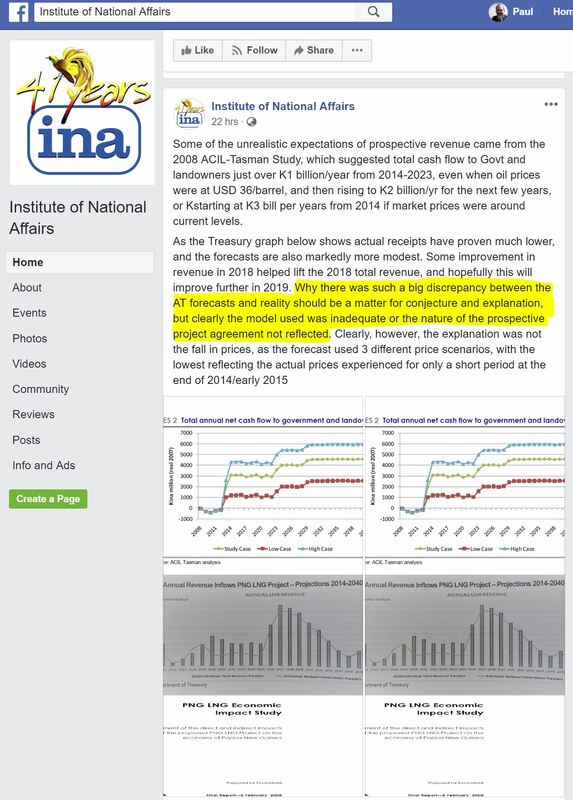 I remember the difficulties I had in explaining the low tax revenues received from the PNG LNG project in a major report I prepared earlier this year (see here). PNG’s Institute of National Affairs had similar difficulties – see here. The quantification of these tax subsidies by the PNG Treasury and IRC helps explain some of the gap between the promise of PNG LNG and its realities. This was a very timely reminder of the enormous importance of getting a good return for PNG from its resources. For at about the same time that I was choking on the K504.3 million number, PNG was signing another deal for another major LNG project. This morning, before the start of the APEC CEO summit, PNG signed an MOU with Total, Oil Search and Exxon Mobil for a new Papua LNG project – see here. Without having access to the details of the MOU, my great hope is that it will work to get much better fiscal returns than PNG LNG. There is no doubt that the PNG Prime Minister and Treasurer are aiming for a better deal. Indeed, it is positive that the agreement signed this morning was only an MOU and not the Final Investment Decision, as there were fears that wanting to have an ‘APEC announce-able’ could have rushed PNG into another poor deal. The tax expenditure analysis of the PNG LNG project is extremely useful in highlighting how even the smallest details of negotiations can have enormous impacts. For example, the thin capitalisation rules allow resource companies to have a maximum debt to equity ratio of 3 to 1 for interest deductions, when normal companies have a 2 to 1 limit. Sounds boring and technical. But the cost from this single tax incentive in 2017 for the PNG LNG project was K170.1 million. And these are annual figure costs – the estimate was a tax subsidy under this single provision of an additional K153.2 million in 2015 and K108.9 million in 2016. 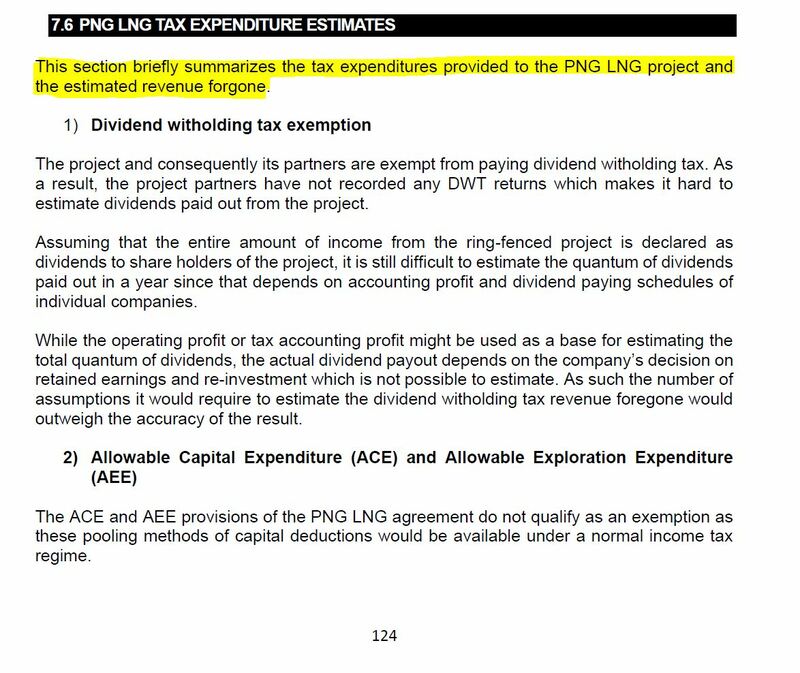 The PNG LNG resource companies are exempt from “interest withholding tax”. Once again, sounds rather technical and not necessarily that significant. The cost in 2017 was K304.6 million – half the entire cost of tuition-fee free education for this single tax concession for a single project. The analysis included in the 2019 Budget also highlights that the K504.3 million tax subsidy in 2017 is the absolute minimum estimate. The report goes through 10 possible tax incentives, and concludes that it only had enough information to cover 4 items with a fifth (infrastructure tax credits) covered elsewhere. The most significant of these would be the “dividend withholding tax exemption” where PNG project partners do not have to pay the normal dividend with-holding tax of 15%. A back of the envelope calculation gives a likely cost of around another K600 million. This is based on the 2019 Budget estimate of a K800 million payment from Kumul Petroleum Holdings – KPH – in 2019, allowing for KPH only having to pass on 70% the dividends it actually receives from the PNG LNG project – let’s be generous and say they pass on 80% which implies KPH gross dividend of K1 billion – KPH having around a 20% share in the PNG LNG, implying around K4 billion in dividends to other project partners – almost all of which are non-residents – and applying a 15% DWT tax to K4 billion implies foregone revenues of K600 million. 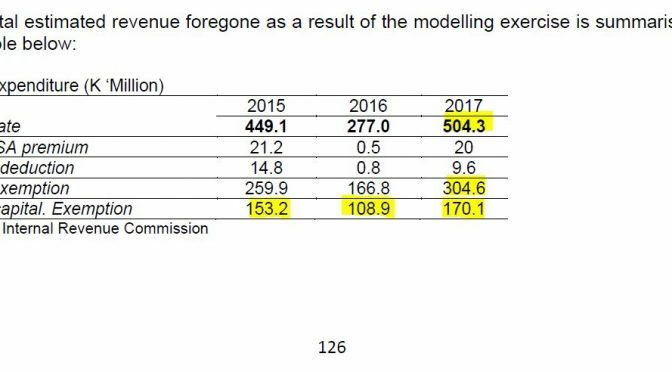 Adding this to the earlier K500 million figure implies tax revenue losses of over K1 billion per year from the PNG LNG project. 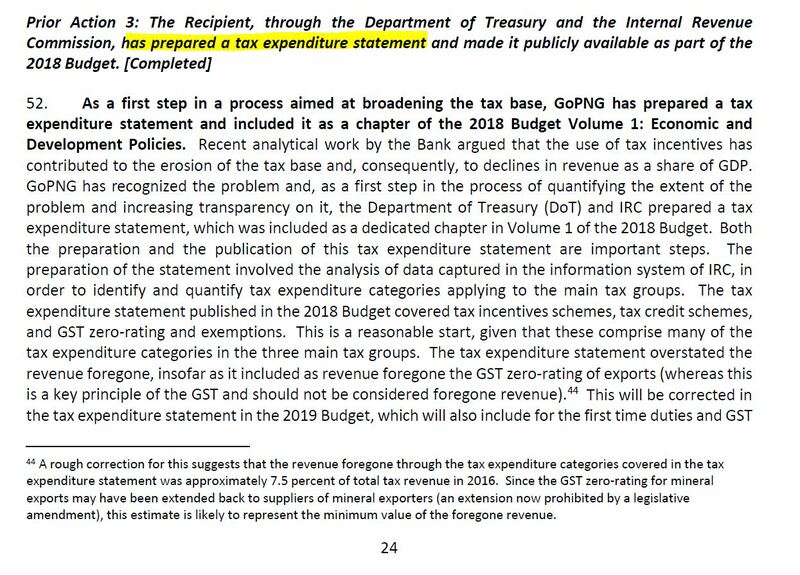 Inclusion of more tax expenditure data in the budget was a prior action required for PNG receiving budget support from the World Bank (see below). Having been responsible for the production of Tax Expenditure Statements in Australia, I know they can be extremely valuable in informing policy and budget decisions. An explicit expenditure subsidy is essentially the same as a tax expenditure when it comes to resource allocation. However, tax expenditures are often hidden from public view, and don’t face the scrutiny of an annual budget process. The increased transparency on estimating tax expenditures is a very welcome development. Given today’s events, its publication could not have been more timely. We do need to remember the costs of providing tax incentives – and forgoing revenue means forgoing possible funding for PNG’s development challenges. I wish the PNG negotiators the best in securing a better financial deal on future LNG and other resource projects. Hopefully, I won’t have trouble eating my breakfast when the 2029 Budget provides details on the size of any tax concessions provided for Papua LNG!